The Microsoft Outlook window is correctly displayed, but you cannot click anything. The status bar shows that emails are permanently synchronized. The issue is related to IMAP. The repair of the PST file should be the solution you can do it by the manual in Resolution of general integration issues with MS Outlook - Option 1. When you receive an email, Microsoft Outlook does not respond anymore and freezes. The issue is related to Microsoft Outlook 2013. The issue can be caused by ESET antivirus software. To solve the issue, you need to deactivate the Read emails function in the ESET settings. For example, you try to open the Company list, but instead of displaying it, you see only the white window. The status bar shows that the list of companies is loaded, but nothing happens. This issue is caused by Microsoft Outlook and its inbuilt Internet Explorer. You can avoid the issue by opening eWay-CRM lists in separate windows. Just download https://download.eway-crm.com/regfiles/open-grids-in-new-window.zip, unzip it and launch it. See Open lists in new window for more information. The error is caused by Microsoft Outlook Address Book if you are using Microsoft Exchange. The solution of the issue is described in Opening of emails in MS Outlook is slow after the installation of eWay-CRM. The incompatibility of graphic drivers may cause Microsoft Outlook to freeze or crash. Solution is to turn off the graphic acceleration. In Microsoft Outlook, go to File tab and select Options. In left menu, click Advanced and scroll down - you need to mark Disable hardware graphics acceleration setting. 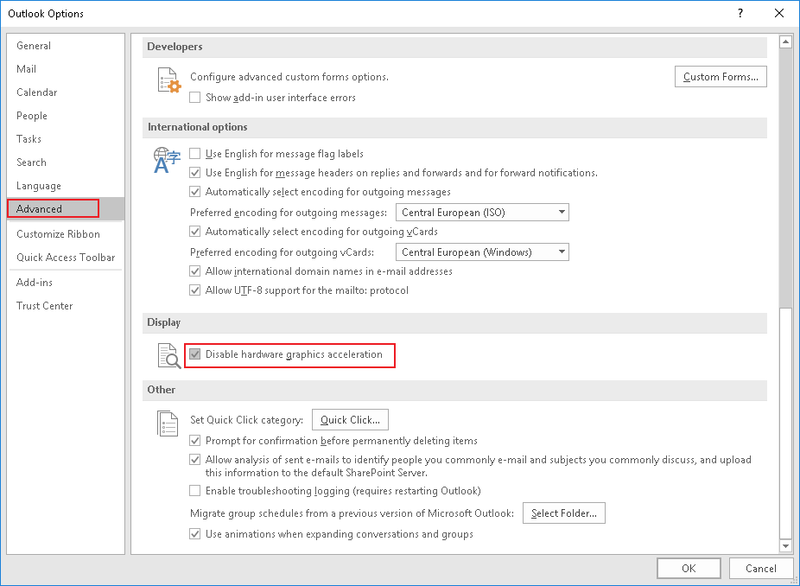 Confirm the change of setting by clicking OK.
Other general solutions that can help you can be found in Resolution of general integration issues with MS Outlook.